This type of IRA allows you to hold alternative investments in a retirement account. But it comes with more rules and risks. A self-directed IRA is a type of traditional or Roth IRA, which means it allows you to save for retirement on a tax-advantaged basis and has the same eligibility and contribution rules. 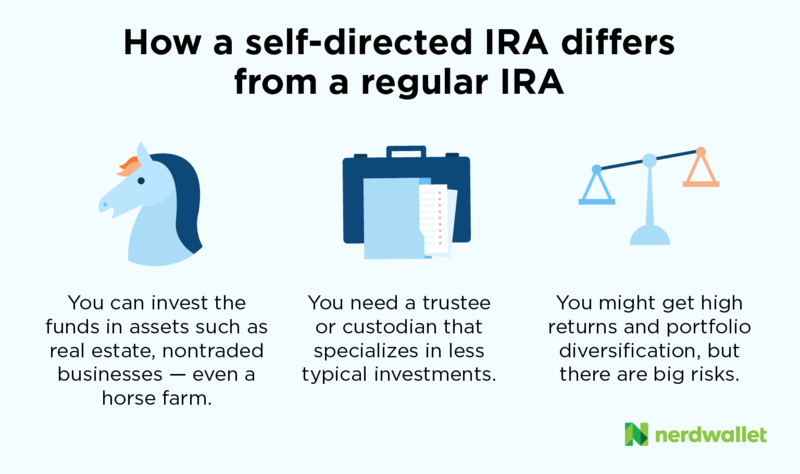 The difference between self-directed and other IRAs is solely the types of assets you own in the account. Where can you get a self-directed IRA? Brokerage firms act as custodians for many types of IRAs, but most household-name brokers don’t offer self-directed IRAs. Given the complexity of self-directed IRAs — more on this below — you might want a financial advisor with experience managing investment deals for self-directed IRAs to help you with due diligence on the investments. A custodian generally won’t offer this. Also, keep in mind that the IRS still forbids some types of investments in self-directed IRAs, including collectibles and life insurance. Once you find a custodian, you’ll open an account and contribute money to it, just as you would with any other IRA. The two main reasons investors take on the risks of self-directed IRAs are to seek higher returns and greater diversification. You can take advantage of higher yields and maybe less volatility. The IRA tax benefit evaporates if you don’t follow the rules, and you might end up owing penalties and interest, too. One potential blunder is neglecting the “no self-dealing” rule, which prohibits you from borrowing money from your IRA, selling property to it, and other interactions. Say you invest in a rental property through your IRA, and then the unit’s kitchen faucet breaks. You say to yourself: “I can fix that myself and save a bunch of money!” Now you’ve broken the rules, because you’ve “furnished services” to the IRA, which the IRS prohibits. If the IRS finds out, the entire account will be considered distributed to you, and thus taxable, plus you’ll owe a penalty — all because you tried to save a little money. Don’t ever spend the night in your IRA-owned rental property. To avoid violating the “self-dealing” rule, think of your IRA as owning and operating the assets within it. In other words, in the example above, your IRA, rather than you, must pay someone else to do the work. And don’t ever spend the night in your IRA-owned rental property. Another rule prohibits entering into deals with specific relatives, including parents and children, and other people. See this IRS page for more on prohibited transactions. It’s up to you to understand the investments you make in a self-directed IRA. It’s very important that the individual investor does all the homework themselves. For his part, John H. Bishop, a certified public accountant and principal at Wellington Capital Advisors, an investment advisory firm in San Francisco that advises clients on investing in self-directed IRAs, says he approaches the due diligence process like an an operational audit. Among other things, he maps out future revenue and expenditures to determine if each investment makes financial sense. Self-directed IRS fees can be many and steep, such as $250 or more for moving your IRA to a new custodian. They also vary depending on the custodian and type of investment. “From what I have observed, the fee structure varies by just about each offering,” Bishop says. Self-directed IRAs allow you to invest in a wide variety of investments, but those assets are often illiquid, meaning that if you run into an unexpected emergency, you might be hard-pressed to get money out of your IRA. You’ll need to find a buyer for the investment. This also can be an issue for owners of traditional self-directed IRAs when required minimum distributions come due at age 70 ½. How much do you know about the investment? What’s it really worth? The Securities and Exchange Commission warns investors that self-directed IRA promoters sometimes list the purchase price, or the purchase price plus expected returns, as the valuation. But that figure isn’t the actual amount you’ll get for the asset. “Investors should be aware that none of these valuations necessarily reflect the price at which the investment could be sold, if at all,” according to the SEC investor alert. Proponents of self-directed IRAs say their ability to invest outside the mainstream improves their diversification, but a self-directed IRA can lack diversity just as easily as any other retirement account. Do you need more than a regular IRA? For most retirement savers, the range of assets available through a regular IRA — stocks, bonds, CDs, ETFs, mutual funds — provide more than enough investment diversity. They are quick and easy to open and provide the same tax benefits as a self-directed IRA without exposure to all the extra IRS rules. Plus, you avoid the extra work of finding a specialized custodian who can set up an account for you. If an IRA seems more your speed, here’s a side-by-side comparison (and links to each one’s in-depth review) of brokers we’ve selected as top IRA providers.